Salina artist Herschel Logan created this pen and ink drawing for a intended book about Waconda Springs. The drawing references a mythological character associated with the Waconda Springs in Mitchell County. 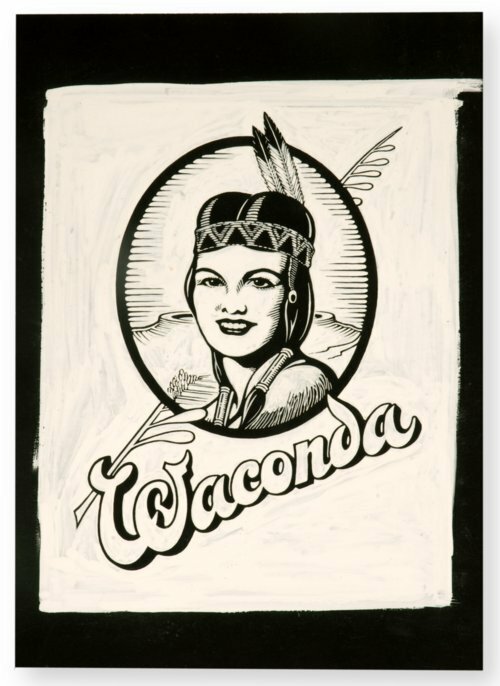 According to legend, Waconda was the daughter of an Indian chief and fell in love with a warrior from an opposing tribe. Upon discovery of their relationship, the two jumped into the Springs and drowned. Their death imbued the springs with medicinal capabilities. Sometime after 1870 a sanitarium and water bottling company were constructed on the site and operated until 1964. That year, the Bureau of Reclamation began construction of the Waconda Lake reservoir, leading to the destruction of the springs and sanitarium. The artist, Herschel Logan worked as a graphic designer in Salina, Kansas, until his retirement in 1968. He was associated with the Prairie Print Makers, a group of Midwestern artists that produced art in the 1930s.